Easter is traditionally a big long weekend for spending, as retailers and consumers alike take advantage of the opportunity for a sale. Incorporating two non-trading days (in most areas) also means the inevitable frenzy on supplies as Kiwis stock up for family road trips. This month, we are only measuring spending over the first half of the weekend (Friday/Saturday), as well as the days leading up to the weekend, as Easter was split between March and April this year. Despite the smaller measured period, we still managed to see some strong spending growth in one of the longest national holiday periods. Consumer spending over the Monday-Thursday period before Easter looks to have been a busy one for retailers. Spending was up 10.9% compared to 2017’s pre-Easter period, while transactions increased 7.6%, suggesting consumers were making higher value purchases. This years pre-Easter grocery stock up seems to have been relatively in line with last years, despite the overall spending growth. Spending at supermarkets and dairies was up just 1.8% over the equivalent Monday-Thursday period last year, while transactions saw slightly more growth at 5.5%. Spending on the Thursday before Friday’s closures also did not see a big jump, up just 2.3%. Although these numbers are low, if last year’s Easter build up was also a busy period for these businesses, we are unlikely to see a big increase in spending year on year, as consumers maintain their peak shopping levels. 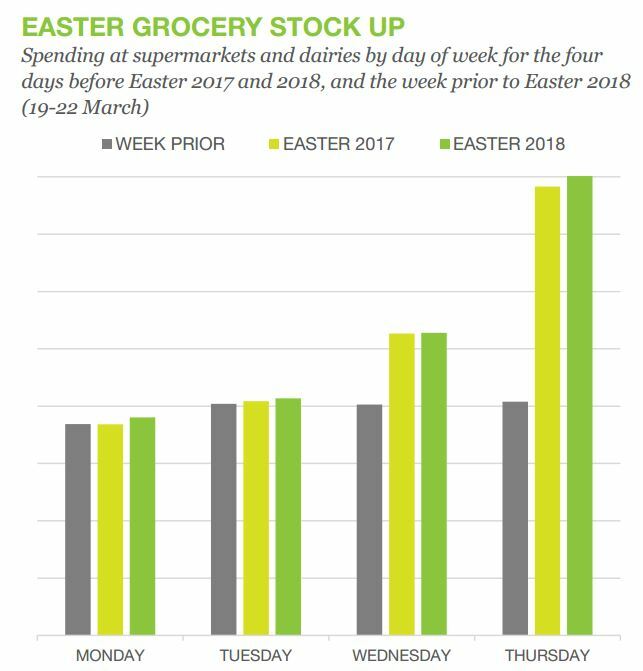 However, if we compare grocery spending on the Thursday before Easter to a week prior, Easter’s shopping frenzy is better illustrated. Thursday’s spending at supermarkets and dairies almost doubled the levels of the week prior, up 96.5%, depicted in the chart below. Liquor stores also saw a big Thursday compared to the week prior, up 160.4% on the 29th compared to the 22nd. One of the fastest growing categories over the four day pre-Easter period was accommodation, which saw spending increase 22.7% on the same period last year. These results may be to do with Easter 2017’s cyclone, keeping people at home and meaning we are comparing to a low base. However accommodation experienced strong spending growth throughout the week prior to Easter, rather than just on the Thursday, suggesting that Kiwis were making the four day weekend into an even longer one, and heading off on road trips early. Road trips did seem to be the pick for Easter, indicated by a 14.7% increase in fuel spending over Monday-Thursday, peaking with a 22.0% jump on Thursday. Fuel prices were only 3c higher than last Easter, so the strong fuel growth indicates more people filling up and hitting the road. Despite the many sales held for Easter, Kiwis made less discretionary purchases on the Easter weekend Saturday than they did last year. On the Saturday, overall consumer spending was up 2.4%, largely driven by purchases of ‘durables’. Hardware and homeware (+19.5%), automotive services (+22.7%), and appliances (+15.6%) were amongst the strongest growth categories of the Saturday, while discretionary (typical sale categories) such as clothing (-7.1%), footwear (-12.7%) and department stores (-13.2%) were all down considerably on last year. Although this suggests that Kiwis were making purchases for the home rather than the wardrobe, there may be another factor contributing to falling Saturday sales for discretionary categories. This year, 39 councils allowed businesses to trade on Easter Sunday, putting less pressure and urgency on Saturday’s shop openings, and potentially spreading spending out over the weekend, and reducing Saturday’s results (Easter Sunday fell on April 1, so will not be included in this analysis). Easter this year was a relatively busy affair for consumers, and some retailers. We saw the usual grocery shopping frenzy, particularly on the two days before Good Friday. Figures also suggested road trips were back on the cards this year, after a damp Easter in 2017, as fuel and accommodation spending saw strong results. However this year, we saw a break from the usual bargain-hunting purchases, as Kiwis focused on shopping for the home, or even taking advantage of the new Sunday trading in some areas.